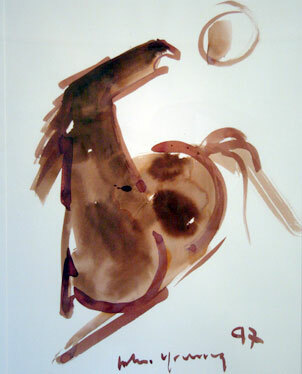 John Young studied traditional Chinese lunar horse sculptures as a young artist, which led to his famous horse paintings. "His horses are always stampeding, much in the same way John lived his life," says David Behlke, art professor and Koa Gallery director. "John Young painted how he lived -- in the moment," says David Behlke, director of Koa Gallery at Kapiolani Community College, which is exhibiting "Joie de Vivre (Joy of Life) -- the Master Work of John Young." The gallery showcases 25 works by Young, on loan from the John Young Foundation. Young died 10 years ago at 87, but like the man himself, his work never waned in vibrancy as he aged. Pieces include colorful and active works on canvas that include Young's famous horse paintings, contemplative drawings and paintings on rice paper, and nine sketchbooks from his worldwide travels. 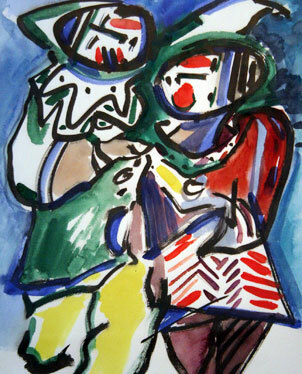 "Two Clowns," a watercolor on paper. "Nothing is ever static in John's work," Behlke says. "The brush is always moving in his paintings; everything is active, in motion. "You can see every brush stroke, and that shows his confidence as an artist. He didn't overwork it. ... 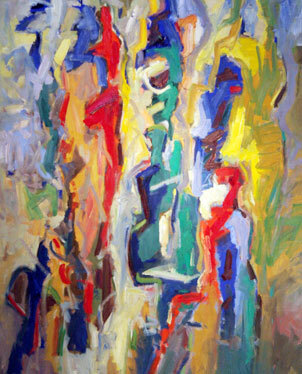 There's also an intentional ambiguity to his work, which makes him a great painter. He leaves room to let us decide." Young was not only a great painter, but an astute businessman, Behlke says. Part of his legacy continues to be a support of the arts through his foundation, which offers scholarships to local artists. "Joie de Vivre" continues through Friday at Koa Gallery. Hours are 10 a.m. to 4 p.m. weekdays. Call 734-9374. 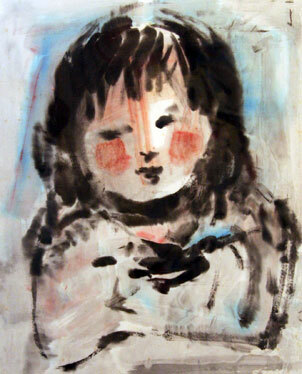 "Woman with Duck," a watercolor on paper that demonstrates Young's contemplative side. "Abstract Horse and River," an oil on canvas, looks at first like a completely abstract work. But study it closely, and one can make out the outline of the horse and rider.